MythMusic is a sophisticated MythTV plugin that allows you to play and manage music and audio files .i.e MP3, Ogg, FLAC, wav etc and play radio streams from the likes of Icecast, Sky FM, Digitally Imported and Radionomy. It is specifically designed to be operated by a normal remote control. This page describes the regular music files features of MythMusic. For the radio streaming part see MythMusic Radio Streaming. The best approach is to follow the installation guides for MythTV and MythMusic that have been developed for your Operating System and distribution. For global MythMusic configuration, go to the Utilities/Setup->Setup->Media Settings->Music Settings->General Settings. MythTV before 0.28 required you to specify a single directory for your music, on this General Settings page. There is also a set of music Tools at Utilties/Setup->Music Tools. Here you can rescan your music library, etc. Recent MythTV versions use Storage Groups to specify where your music is stored, which must be configured with mythtv-setup. Note: The location of menu items depends on the Menu Theme you have chosen. In the classic menu theme all the menu items are available in the Music menu. In the default menu theme the menu items are scattered thoughout the menus. The menu locations given on this page are for the default layout. Because MythMusic has been designed to work with a remote control, people often struggle with it, especially when building and editing playlists. Once you become familiar with how it works, which does not take long, you will be amazed at how much more accessible and enjoyable it makes listening to your music collection. There are three ways to add music to MythMusic. You can rip existing CD's, copy your tracks to the existing music directory and do a rescan or you can also import tracks from another location into your music directory. Each method will be explained below. Before you start to rip a CD into MythMusic there are a few things you should check. Make sure your CD device is set correctly - Setup->Media Settings->Music Settings->General Settings. Make sure that your system is not set up to mount the CD and begin playing it automatically. Gnome: System→Preferences → Removable Drives and Media Preferences. Insert an audio CD, which will trigger a pop-up window. Select "X Do Nothing", tick the "Always do this for this type of media" checkbox and press OK.
Go to System Settings → Notifications → Storage Media Notifications → (Notifications tab) Medium types, select: Audio CD. "X Do Nothing" should have "(Auto Action) after it. If not, press the "Toggle as Auto Action" button. Insert the disk you want to rip, after a few seconds MythTV will query the Internet freedb database for your CD information and the Import CD screen will show, with the Artist, Album and tracks information. You can make changes to any of the items on the screen at this point before you finally select the "Rip CD" button. To edit an individual track, use the 'edit' key (see below). You now see the progress screen showing each track as it is ripped and encoded, as well as the overall progress on the whole album. Once import has finished you can configure your CD to be ejected. Utilities/Setup → Setup →Media Settings-> Music Settings → General settings. Utilities/Setup → Music tools → Scan for New Music. MythTV will then scan for music and add the information into the MythTV database. You should also do a rescan if you changed the tag information using a tool outside of MythMusic so it will pick up any changes. Note: for MythMusic to notice the changes the modification time of the files needs to have changed. Alternatively of course, you can copy your existing collection across to the folder that MythMusic has already begun building your collection to. If you have files that have been ripped to Apple's AAC format this should be no problem. Either copy these files into the MythMusic directory and then scan for new music, or mount your collection onto the systems file system and point your MythMusic directory to it as above. If you have some tracks you want to add to your music directory then one easy way to do it is to import the tracks using MythMusic. It will copy the tracks to your music directory for you creating the necessary directory structure and renaming the files based on the preferences you have told MythMusic to use. If you wish to remove some music from MythMusic, remove the files on disk and re-scan. MythMusic supports the display of album art with the name 'cover.jpg' found in the same directory as a music file or embedded in MP3 files with ID3V2.3 or ID3V2.4 tags. The metadata editor also allows you to search Google images for any suitable cover art, artist and genre images. It's up to the user to determine if they are allowed to use any of the images they find. Note: If you add album art onto an existing collection using software such as "EasyTag" which preserves file modification time by default, you will need to make sure the timestamp of the files is updated (use 'touch') so that Mythmusic rescans the files properly. Otherwise the album art won't appear. There are several views in MythMusic :- Current Playlist, Playlist Editor - Tree, Playlist Editor - Gallery, Search and Full Screen Visualiser that can have overlapping features depending on what the themer wants to show. Most widgets are optional so it is up to the themer what you get on any view. The following images and descriptions apply to the default and MythCenter themes. From the main menu you can show the Current Playlist view by choosing Media Library->Listen To Music. To show the Playlist Editor views go to Setup->Media Settings->Music Tools->Select Music. You can also switch to any view while on any of MythMusic's views by pressing MENU then select Switch View and choose a view to switch to. 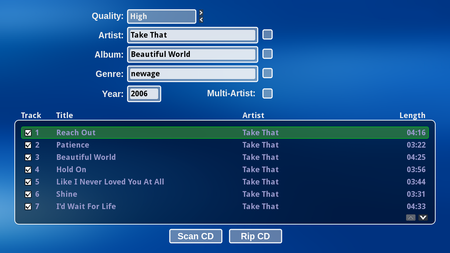 This view is the main playback screen and shows the current (working) playlist at the top and the current tracks metadata below. It also shows some playback controls and the active visualiser along with the current volume status. 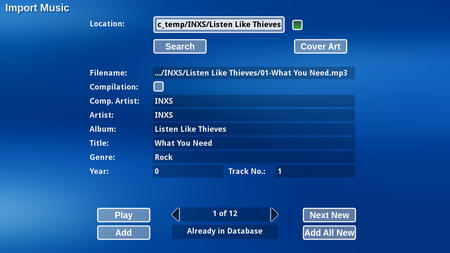 The Playlist Editor views show the browse-able metadata tree at the top, the current playlist in the middle and the currently playing track below. The Search view shows a list of fields to search, the search text, the number of matches and a list of matching tracks at the top, the current playlist in the middle, and the currently playing track below. MythMusic works on the principle that any tracks you wish to play must first be added to a current (working) playlist. There are many ways to add tracks to this playlist like browsing for them in the playlist editor views, searching for individual tracks on the search view or using the quick playlists on the popup menu. Selecting one of the options will allow you to either replace or append any matching tracks to the working playlist based on the currently playing track. So for example if a track is playing that you would like to hear the rest of the album you would choose 'Tracks from current Album' which would either replace or append all matching tracks to the working playlist. The Playlist Editor views allow you to browse your music collection looking for tracks you would like to play. Pressing SELECT (MARK in the gallery view) on any node in the tree will allow you to add or replace any tracks below the current node to the working playlist. A couple of examples will hopefully make things a little clearer (both the tree and gallery views work in the same way though it's easier to see what is happening in the tree view until you get used to it). 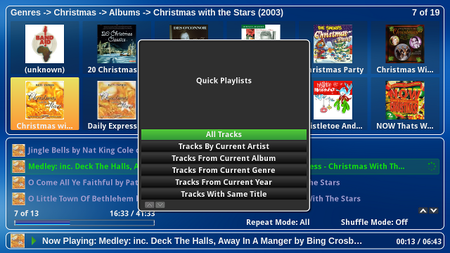 Lets say you want to play all your Christmas tracks, in the tree on the far left move to 'Genres' then move right to the list of genres, find 'Christmas' in the list then press SELECT/MARK. You will be given the choice to replace or add the tracks on the working playlist. Lets try a more complex example, say you want to play all you favourite tracks from Dire Straits, in the far left of the tree select Artist and move right, find Dire Straits in the artist list and move right, select 'Ratings' and move right, in the list of ratings press SELECT/MARK on the highest rating to add/replace the tracks on the working playlist. Note: Some lists can be quite long like the Artist list a quick way to find what you are looking for is to use the button list search feature available in MythTV. You access it by pressing CTR-S or MENU then 'Search List...'. Entering text in the search box will scroll the list to the first item that matches the search text, you can also find the next/previous matches using the buttons in the search popup dialog. Note: The popup menu that is shown when you press MENU is context sensitive so the options shown will depend on what widget has the focus and even what node in the tree has the focus. For example if the tree has the focus and a playlist node is selected you will see options to add and replace the tracks in the playlist to the working playlist as well as an option to remove the playlist. The 'More Options' menu item will always open the standard menu with the usual menu options. The search view allows you to do a quick search for a track you want to add to the working playlist. You can search the Artist, Album, Title, Genre or all of them for some text you enter. For example say you are looking for a track that you know has 'cars' in the title but can't remember who it is by or what album it is on you would select 'Title' in the fields to search and enter 'cars' in the search text which would give you a list of matching tracks you can then individually add to the working playlist. Lets say you have added many tracks to the working playlist and you would like to save it so you can add the same tracks again in the future. On any view that shows the current playlist press MENU then 'Playlist Options' then 'Save to New playlist' and when prompted enter a name for the playlist. Alternatively you can choose 'Save to Existing Playlist' which will prompt you to choose from a list of existing playlists to save to. When you later want to add the tracks to the working playlist on any of the Playlist Editor views choose 'Playlists' in the tree then move right to choose one of the saved playlists you can then add/replace the tracks as usual. You can add/edit Smart Playlists on both of the Playlist Editor views by selecting the 'Smart Playlist' node in the tree and then depending on what node is selected you can add/edit/delete a smart playlist by pressing EDIT/DELETE or choose an option from the popup menu. Once you have created your Smart Playlists you can use them by going to the Playlist Edit view and in the tree select 'Smart Playlists' then move right and choose the category, then move right and chose the name of the smart playlist you want to use. 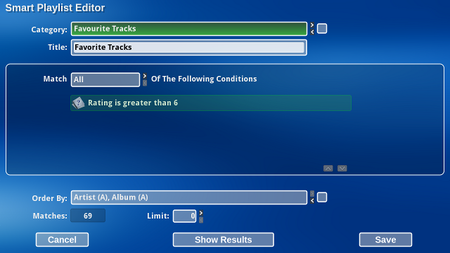 Select it and you will be able to add/replace the tracks to the working playlist as normal. Nothing beats listening to your music collection and having an accompanying visualization on your large flat panel TV. There are currently a number of visualizations for MythMusic that will be displayed in a small window on some views (only the Current Playlist view in the default theme but it depends on the theme), but will be displayed full-screen when you change to the full screen visualization view. Random Switches to a different visualization for each song. MonoScope Standard spectrum analyzer, as found on many MP3 players such as XMMS and WinAmp. StereoScope Another spectrum analyzer. Left and right channels are drawn separately. Goom The classic visualization of crazy lines and patterns. AlbumArt This displays the album art for the currently playing music. Basically, any image found for the music file currently playing is treated as if it might be album art including any Artist image if available, and each found image will be displayed in sequence. (note these are based on the default key mappings, you can re-assign these in MythTV's Edit Keys setup screen). SEARCH CTRL+S Show button list search dialog (Global context). This will only work when a button list has the focus. EDIT E Edit a track's metadata (Global context). This is context sensitive so the metadata shown will depend on where the focus is. INFO I Show a tracks metadata (Global context). This is context sensitive so the metadata shown will depend on where the focus is. DELETE D Delete (Global context). This is context sensitive. In the current playlist it will remove the selected track, on the edit playlist tree it will delete a playlist/smart playlist etc. MARK T Toggle track selection. This has the same effect as pressing SELECT on a node on the playlist editor tree (mostly useful on the gallery view where SELECT has another function). As with all MythTV development work, modifications are worked on as "tickets" on the MythTV Trac Server. To have a look at the latest developments on the active tickets for the MythMusic module, scroll down to the Plugin - MythMusic section of the Active Tickets by Component page. The wishlist for MythMusic development ideas is part of the Feature Wishlist (Plugin Addons) page of this wiki. Before editing this page however, please read the guidelines on the Feature Wishlist page. MythTV's information, including MythMusic, is organised using MySQL database tables. These tables are not accessed directly by the user, but it can be useful to know where the information is stored when administering a MythMusic setup. See Database Schema for more information. Mediashares gives a simple walk through of how to export your media directory so its accessible from your other remote Mythtv systems. Note: The information that follows below may be outdated and no longer work or may not be relevant to the current version of MythMusic. Here is how I sync'd MythMusic with an already established iTunes setup. All of our music is stored on a laptop (my wife is a DJ so it must be portable) that runs Windows XP. I wanted to back the music up to our myth box, and also make the songs and the playlists that were already created in iTunes, available via MythMusic. First, I decrypted any purchased iTunes music using QTFairUse. The decryption was only necessary to allow MythMusic to play music purchased from the iTunes Music Store (Please don't steal music!). 4. Select "Share this folder"
5. Note the share name, e.g. "iTunes"
In mythfrontend, I setup MythMusic to look for music in /storage/music and performed a scan for new music. It found all of the music and populated the database (Note: you must have AAC support enabled for MythMusic to find AAC files). Next, I wanted all of my iTunes playlists to appear in MythMusic. I found this page that provides a utility script that creates MythMusic playlists from an iTunes library xml file. Since I'm using myth 0.20, I downloaded this version of the script. Versions before 0.20 should download this version. There's a small bug in the 0.20 script as is, so I had to open the script in an editor, search for "playlistid" and replace it with "playlist_id" (Note the underscore). I also had to change the values of the variables at the top of the script to suit my system. Then I ran the script and my playlists were imported into MythMusic. I finally setup cron scripts to periodically attempt to sync with the laptop (using the same rsync command as above), and rerun the mythtv-itunes.pl script to keep the playlists up to date. I wasn't happy with a couple of things that the previous scripts did, and so I started changing them here and there, and eventually most of the thing was gutted. So here's my version of the above scripts, tested and found working on Myth 0.21. Previous scripts have been more general in that they searched the MythMusic database for similar Artists and Song Name and Album and then they called that a match. I didn't like this behavior for a couple reasons. I could never get non-ascii characters in the ID3 tag to map properly. The script would just give up on those songs. Similarly, I have a few songs where the Album field is blank, but the Song Name and Artist are the same (different recordings, live shows, etc) and the previous scripts would simply match all these to the first finding of the song in the database. By matching on filename, we actually get the correct matches and the matching is much faster. Instead of accessing the database once for each song in your iTunes library, it accesses the database once for the entire library. Tests thus far have shown a speedup of 400% over previous scripts! We also don’t have to worry about the ID3 tag containing "non-standard" characters, the songs will still map. So you can keep your Latin and German music with it's non-standard characters and still have matches. A couple of gotchas though. I'm no character encoding genius, in fact I'm probably a character encoding idiot, but from my little research for this project I noticed iTunes will store non-ASCII characters just fine as escaped hex values in the iTunes library XML file. MythMusic, on the other hand, doesn't seem to store that information, being a Latin1 database. I'm also a Perl idiot, so I never figured out how to change the data correctly. Basically, if you have non-standard characters in the actual filename (not the ID3 tag), these songs will probably not map. Sorry, but if someone knows how to do the proper conversions in Perl to make iTunes and MythMusic play nice, that would be a nice feature to add to the script. Also, if you find my explanations to be bogus, just remember I might not know what I'm talking about. Also, while I really don't believe this will ever be a problem, I might as well disclaim it. I've tested this script on my library (~1700 songs) and it works great. However, because this loads some of the music_songs database into a Perl variable before it starts matching, the memory footprint of this script could be larger than the previous Perl scripts. I'm interested in how even the largest of music libraries perform with this script. I started development of an iTunes to MythMusic conversion script using the same XML file when the first two results didn't work out for me. I posted it up at this site and then last fall someone else took a stab at the source and sped the whole thing up. Basically all you have to do is rsync your music to your system and then scan for new music in MythMusic setup. Run the script and it will map each of the files to their ID numbers in the myth database and then create all of your playlists so that they'll be available on any of your mythboxen. The source is made available through subversion so please feel free to develop speed improvements or solutions to the overall puzzle and send me patches but as it stands a 11000 song library takes less than a minute to map and it's only missing the special chars Brian.phillips mentions above and the m4v files that MythMusic doesn't store in it's database. I use RubyRipper to rip my CD Music library. I also prefer a much different directory and file layout then MythMusic uses. The RubyRipped files are my 'master'. MythMusic 'Scan for new music' will NOT successfully identify music files that are themselves symbolic links. Scanned files, for now, must be hard links. As space is a consideration though, I don't want to manage two sets of directories with duplicate copies of the same data. So, the solution is to do a HARD LINK from the master audio archive directory to the target mythtv/music directory. Note: Hard links must exist on the same file system. So, this only works if your audio library directory and mythtv director are on the same volume/partition. This little perl script when run will find the all files under audioarchive/vorbis. It then splits the path. This script array elements 4,6,7 of that path align with genre/artist/album. Directories are created under /mythtv/music and a second HARD LINK is created to the master audio file. You'll need to adjust the array element numbering to match your archive path structure and also adjust the order for your MythMusic path. I also modify the permissions of the '/mythtv/music' directory and files to be 'read-only' because I don't rip from MythMusic setup. While the built in ripper is very flexible and includes all the elements for creating a complex and unique hiearchy -- it doesn't support ripping multiple formats at once like RubyRipper, or swapping out the default ripper with a command reference to a ripper of choice. So, note that if you use the permission settings in the perl script, all attempts to rip from the MythMusic interface should/will fail since the mythtv user has no write permissions under /mythtv/music. # and the symbolic link to the song titles. `mkdir -p "$mythMusicPath"`;    # -p no error on existing. Save Cyles with first -x check? databasebox.o: Couldn't find your CD. It may not be in the freedb database. These files aren't automatically deleted because of a conscious design decision by the author that programs that automatically delete things are bad. The files are used to locally cache CD lookups. If you are re-inserting CDs, your machine will not actually have to go out to the Internet to determine what is on them. However, the URL used to access the freedb database has recently changed, so the stale information in the files from previous runs of MythMusic would cause the error above. Once the files have been deleted the stale information will be gone and your local database will be rebuilt as you use CDs. If this error is present, you may need to edit the audio device. Go to Utilities/Setup -> Setup -> Media Settings -> Music Settings -> General Settings and edit the "Audio device" field. Enter the value, "ALSA:plug:iec958". This page was last modified on 2 February 2019, at 11:45.